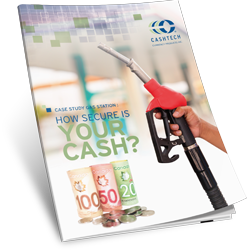 Case Study Gas Station: How Secure Is Your Cash? was common to find a discrepancy when reconciling the day’s sales. When a discrepancy was uncovered it meant a sometimes lengthy investigation and since they had lane accountability it was often difficult to determine who was responsible. The store managers spent hours reconciling, preparing the deposits and would sometimes be gone for up to 2 hours making a daily trip to the bank. Fill out the form on the right and discover how our solutions helped this gas station keep employees safe and improve their management of cash.